"3LA1, V-2089" by Timothy K. Perttula and Robert Z. Selden Jr. CONTEXT INFORMATION: From a grave (Burial A) in a cemetery excavated in 1940 by Glenn Martin or Robert Shelton. Associated vessels in the grave are V-2090 and V-2091. DECORATION: The rim has four engraved panels defined by upper and lower horizontal engraved lines (both have fine tick marks) and sets of three vertical engraved lines, the last of which also has fine tick marks. Within the panels themselves are seven semi-circular lines that have fine tick marks on them. 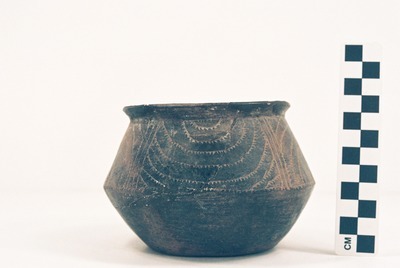 Means Engraved carinated bowl (5425-2023): a, photograph; b, drawing by Bobby Gonzalez.